It had rained for three days prior to my arrival which meant that hunting over a water source would probably not be very productive. Trey Aars set me up on a well-used antelope trail leading to an alfalfa field. Antelope were coming into the field from all directions, but no shooters close to me. Hunted that first day without a shot, but we set up an alfalfa hay blind (portable) that afternoon for the hunt the next day. Of course, the next morning 'big boy' went right by my previous pop up blind, but he worked his way towards me, disappearing behind me just over the hill. Shortly there after, I had 14 bucks in front of me at 79 yards. While looking at this group, I suddenly had a large buck chasing a smaller one come past me, making a circle around me (running at full speed) and disappearing over the hill behind me (where big boy had gone) I suddenly saw the small buck run from behind me towards the north, and my antelope came up 40 yards behind me and snorted.........staring at the departing smaller buck. 40 yards. And the rest is history. After the shot, my buck went over the hill and laid down. I came out of the blind and saw 'big boy' walking away across the flat plain and then saw my antelope laying down. Great hunt. 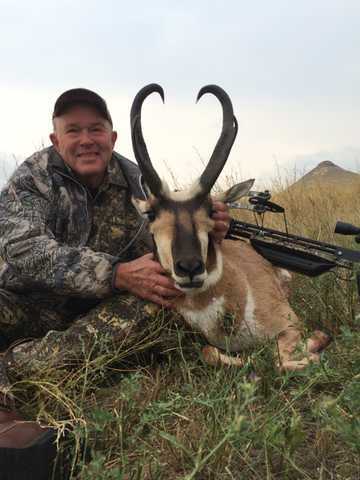 I am coming back next year for a combination antelope/deer hunt. 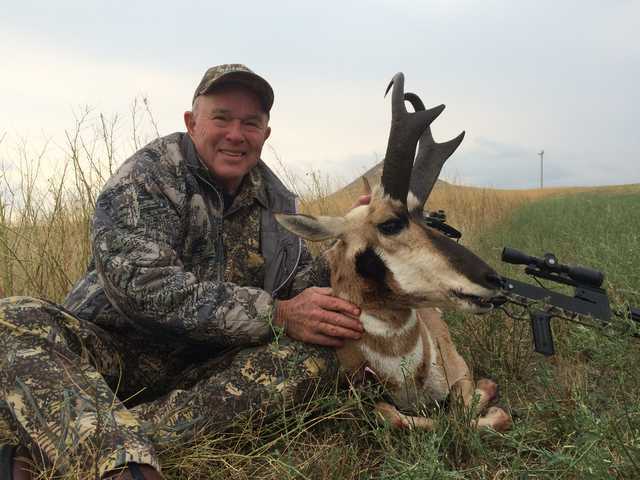 Trey has a great operation and a lot of deer (mule and whitetail) located along the Belle Fourche River and other areas.